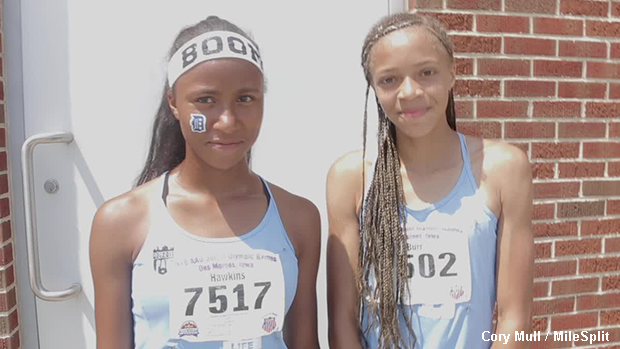 The 4x100 relay squad representing the Detroit Pal Track Club set a new AAU Junior Olympic Games record in the 14 year old division last week in Des Moines, Iowa. The quartet of Olivia Jenkins, Leeah Burr, Comari Hawkins and Kaila Jackson posted a stellar time of 46.07 in preliminary round action to usurp the previous best result of 46.28, which was established by the Teon Elite Track Club (FL) back in 2016. Detroit Pal dominated their heat, winning the race by over three and a half seconds. They then went on to place first in the 4x100m final due to their 46.25 effort. Again, it was a decisive win - this time outpacing the runner-up team by over a second. The Fort Worth Outlaws Track Club (TX) finished second with their time of 47.58. Despite their tremendous showings, all team members feel like they're just a few tactical adjustments away from producing a much faster time. Detroit Pal's team members insist that with clean exchanges, they can break 46 seconds.